So I could pretty much just sign off here, as I’ve covered the gist of this entire post in the title. But to make sure I completely convince you that you need this deodorant in your toiletry bag let me fill in the gaps. I’ve been testing a constant stream of cruelty-free and aluminium-free deodorants since I started this blog (see here, here and here) – but what I’ve found again and again is that they work well to a point (that point being where the heat of summer in Queensland, Australia, kicks in) and then they seem to stop working well. I had found one cruelty-free, but not aluminium-free, deodorant that worked really well (review coming soon) and resigned myself to the fact that I would have to give up on finding an aluminium-free option (Brisbane’s subtropical climate and my corporate ‘day job’ were not mixing well with my aluminium-free trials), that is until I discovered A Bit Hippy Nothing To Smell Here Natural Cream Deodorant. I first wrote about A Bit Hippy when I found their products in a local health food store. Their products are targeted at people with sensitive skin, so I shared the information on the brand but didn’t buy any products as I don’t have particularly sensitive skin. In hindsight what I should have realised is that these products are suitable for sensitive skins because they use only the purest ingredients and so are in fact the kinds of products that everyone should be using. 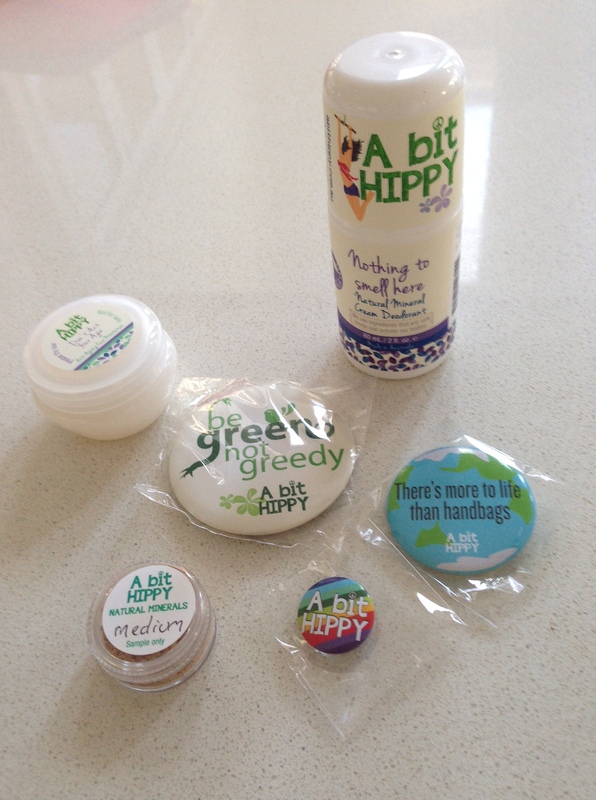 Well the lovely people at A Bit Hippy sent me some of their products to trial – including the Nothing to smell here – natural mineral cream deodorant, Rice and fresh – face wash for the body, and Don’t act your age – anti-aging face moisturiser. I started using the body wash and moisturiser straight away, but have to admit I was a bit skeptical about the deodorant (given none of the previous aluminium-free deodorants had worked) so it sat on my bathroom bench for about a week until I decided one weekend to give it a go. To be honest I don’t get why it works – but I have to say it DOES work … and I mean REALLY WORKS! And I’m not just saying that because they sent me the product to trial (I will always be honest about the products I include on here – including whether they have been purchased by me or sent to me). This is without doubt the best cruelty-free and aluminium-free deodorant I have found for everyday use. And I’ve since purchased another two and bought another one for my sister (who was sold after she did the sniff test of my armpits after we had been out for the entire day – disgusting I know – but sisters do that). I’ve found it works best by giving it a good shake, applying quite a lot of product, and then making sure it is dry (with a quick blast of my hair dryer) before I get dressed. It does leave a little white shine – but it’s not too visible. The only times I’ve felt it isn’t working is when I’m exercising (which to be fair is expected) and on some of the really really sticky, hot days when I’ve been running around – so I give it a 98% effective rating – a winner in my book! You need this deodorant in your toiletry bag (if I haven’t mentioned it enough already – it’s both cruelty and aluminium free!) and it comes in the cutest delivery box! My last order also included a sample of the Don’t Act your Age Moisturiser (which I gave to my sister and she loved – it also worked amazingly on some sunburn she had on her neck) and a sample of the new Natural Minerals powder they are developing. There were also some seriously cute badges that Little Miss Six grabbed straight away and they are currently on her school bag. 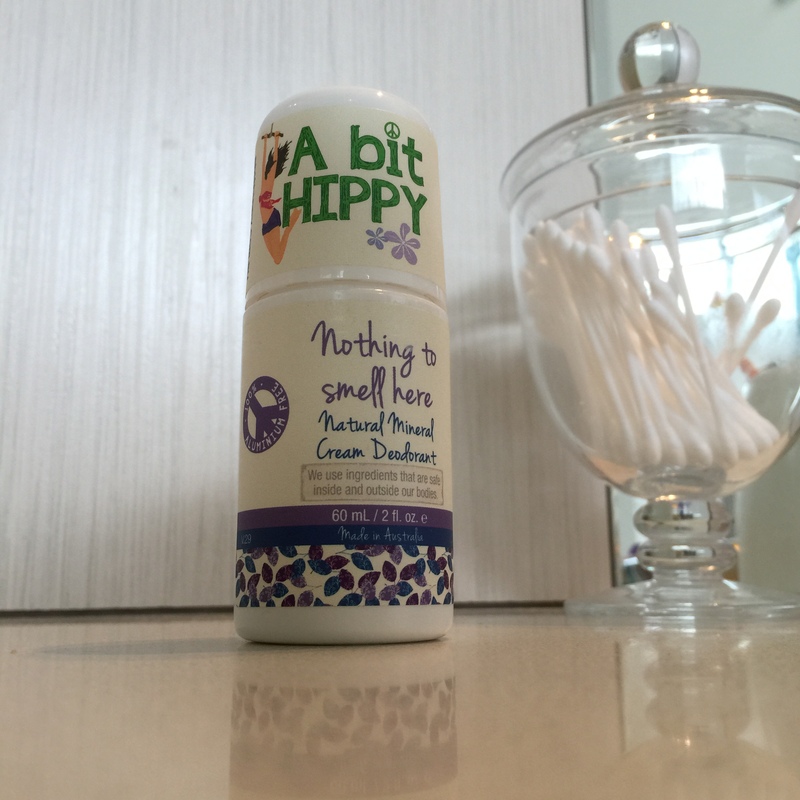 PLEASE PLEASE try A Bit Hippy Nothing to Smell Here Deodorant – maybe deodorants work differently on different people, but I’ve been so amazed with this product I would love other people to try it too. A Bit Hippy Nothing to Smell Here Deodorant costs $7.50 for 60ml. Get it online here.